Parisians tend to steer well clear of Paris’ Champs-Élysées for fear of the relentless crush of tourists. The arrival of La Maison du Danemark, however, may be just the ticket to lure them back to this part of the 8th arrondissement. Copenhagen-based design studio Gamfratesi has divided the two levels into two distinct restaurants, dressing the spaces with a catalogue of covetable pieces, among them Gubi’s ‘Beetle’ and ‘Masculo’ chairs, and a ‘Targa’ sofa by Gebruder Thonet Vienna. On the ground floor, Flora Danica is a contemporary Danish brasserie, furnished in black and white herringboned marble and delicately drawn mimeographs of botanicals, alongside a light-washed conservatorium. 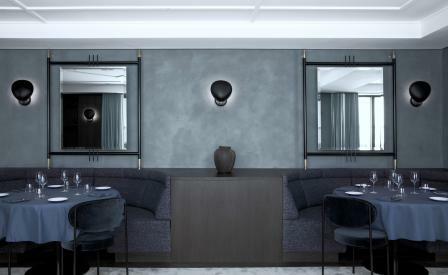 Upstairs, the more formal Copenhague is cloaked in dark blue leather and Raf Simons Kvadrat textiles. The menus at both restaurants have been conceived by the Danish chef Andreas Møller as odes to French-inflected Nordic gastronomy which explains the traditional salads and beef tartare in Flora Danica, and the fancier ris de veau, and langoustines upstairs.